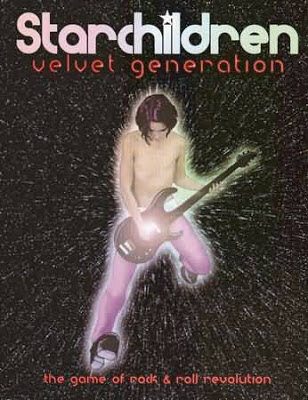 Starchildren: Velvet Generation is a glam rock RPG with a sci-fi setting cribbed largely from Ziggy Stardust. It’s 2073, and a global wave of cultural conservativism has suppressed all but the blandest possible music, literature, and other media. The oppressed youth fear the harsh crackdowns of the Ministry of Music – AKA “Mad Mother” – the most powerful and brutal of the censorious global Ministries that suppress the arts. However, the underground network known as “Velvet” (the “Velvet Underground”, if you will) are not taking this lying down; collaborating with various illegal bands, they seek to allow gigs to take place and to spread the word of rock and roll across the world once again. They get unexpected help from the Starchildren – androgynous aliens whose ancestors picked up transmissions from early-1970s Earth and sent a generation ship to make first contact. The Starchildren are all for bringing some glitter and stardust back to the drab lives of the Earthlings – but their fragile forms and naive ways make them more vulnerable than they might otherwise be to the ravages of drugs and alcohol, Man Who Fell to Earth-style. The game assumes that the player character party are going to be a band, with PCs being humans or Starchildren as they wish. The Starchildren are basically Ziggy Stardust riffs, right down to the point where they don’t automatically have a gender or sexuality but can choose to taken them on for the sake of infiltrating Earth society. (Neatly, the book makes sure to mention that there’s plenty of LGBT Earthlings too – avoiding the pitfall of making those qualities seem intrinsically alien.) The Starchildren also get access to Mojos, the magic skills of the game, which allow them to transform themselves, affect the minds of others, and generally be super-otherworldly rock stars. The humans, on the other hand, get more background picks and skills, having had an actual lifetime on Earth to learn them, and are also a bit more robust, though they can’t learn Mojos and they don’t have the otherworldly glamour that the Starchildren enjoy. Action resolution in the game works on a card-based system, which in play should afford players a reasonable amount of choice as to whether they want to go all-out on an action and likewise gives the referee a little capability to softball things on their side if they think it’s appropriate. In particular, there’s an asymmetry between the meaning of the cards the players play and the meaning of the cards the referee plays (essentially, what matters for the players is what suit they play, whilst what matters for the referee is the actual number on the cards), which is nicely empowering for the players. As far as expected play, as well as staying ahead of the baddies and generally doing all the stuff you expect player characters in a near-future dystopia to get up to, player characters will also do gigs – and there’s a fun GM-side system for tracking how much fame the PCs are building up, and thus how prominent they are becoming in the Velvet Underground. I just have one criticism. See, I get why they set the game in 2073, since it’s the centenary of Aladdin Sane and all, but thematically speaking, in terms of the official suppression of music and extraterrestrial intervention coming in to save rock for all time… shouldn’t they have gone for 2112?